A little bit of family history was made today. 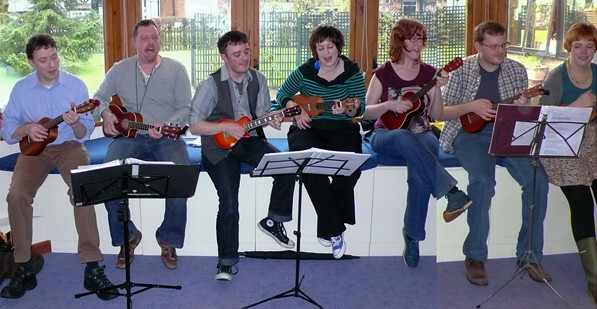 This afternoon Moselele (the ukulele band I play in) performed a gig as part of a sensory weekend for the kids at Acorns Children’s Hospice in Selly Oak. There were four or five young people with Profound and Multiple Learning Difficulties listening in, along with carers and volunteers. Music is one of the things that stimulates the children with PMLD and as we ran through our set, some were smiling or waving their arms response to the music. It was a lovely sight. But it was a particularly poignant day for me because my mum was Ann Cullinan, the founder of the Acorns Children’s Hospice Shops. Here she is standing in front of the first charity shop in Cotteridge in 1987 – before the hospice even had a name. When I got home from the gig, I went up into the attic to find a certain box containing a certain chapter of Acorns history. Whatever Mum asked for, she got. Acorns was the biggest charity cause in the Midlands at that time and people gave generously. Vans, shops, sponsorship. Once she even got an offer of all the conference carpet from the NEC. She took it – and turned it into cash, somehow. The rise of the Acorns shops seemed meteoric. The clipping above in Mum’s scrapbook album shows the Cotteridge shop had been open 54 days and had already raised £21,000, in the main thanks to Mum’s drive with help from the shop volunteers, who became known as ‘Ann’s Army’. At its peak, I remember the shop raising £4,000 a week. More shops opened, first in Stirchley then in Kings Heath (I think there are more than 40 now). Within two years, the shops had raised £350,000. It felt like a triumphant achievement by the whole city when, on 14 December 1988, Acorns was opened by Princess Diana. Of course, we got a classic Di shot for the family album. Mum gave up her work with Acorns in the early 1990s when her health became an issue. But she never stopped her charity work, turning her final months into a highly organised preparation for her own fundraising funeral to raise money for Huntington’s Disease. Here is the letter she wrote – which she made me type – that appeared in her remembrance booklet. You can see she was very proud of all that Ann’s Army achieved with Acorns. Mum died in 2001. I remember ‘doing the PR’ for her fundraising funeral and the Evening Mail’s headline ‘Pennies from heaven’. It was a terribly sad time. But now I remember my mother as she was in these photos: happy, smiling and unfailing in her efforts to help others. So that is why today was a special day. Much of my teen life was wrapped up in fundraising for Acorns and yet today was the first time I went inside the unit and saw the amazing work that they do. After Moselele did their set, I asked Pauline, the activities coordinator, how long she had been working at Acorns. Coming full circle by doing something for the Acorns kids, remembering my mum (I can’t believe it has been 10 years since she died) and see the fruits of all that fundraising labour was fantastic. But someone from Acorns remembering – that was the thing that really made my day.